The EPD programmers offer a cost effective version of the Flame-Monitor control. EPD style programmers provide the same start-up programming, safe start check, and flame monitoring supervision as their counterpart EP style programmers. The major difference between EP and EPD style programmers is that the EPD programmers incorporate a built-in display consisting of seven (7) LED indicator lights to annunciate the current operating status of the Flame-Monitor control, as well as the reason of the last lockout condition. EPD programmers provide a switch-selectable option that requires the air flow switch (terminals 3-P) to be open at the start of the operating cycle. The EPD programmers include an RJ45 style connector to interface with a remote alpha-numeric display (P/N ED510) 1 and two (2) RJ style connectors to connect to an E500 communication interface. The EPD programmers do not require the ED510 alpha-numeric display to operate. The ED510 display is optional for EPD programmers, but is required for the EP-style programmers. The EPD Flame-Monitor System can be upgraded to include an E300 Expansion Module (remote ED510 alpha-numeric display required). A set of test jacks located on the front of the programmer module provide a 0-10 VDC output to indicate flame signal strength. CAUTION: While programmers are mechanically interchangeable in that they mate with a common wiring base, you should select the correct model for your application. Inappropriate application of a control could result in an unsafe condition hazardous to life and property. Selection of a control for a particular application should be made by a competent professional, such as a boiler/burner service technician licensed by a state or other government agency. 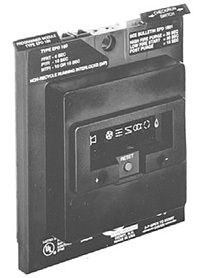 EPD100 and EPD200 series programmers provide an additional 30 second low-fire purge. All programmers offer selectable Prove Air Flow (3-P circuit) Open To Start feature. All programmers have 4 second FFRT. EPD Style Programmers include a built-in LED display.